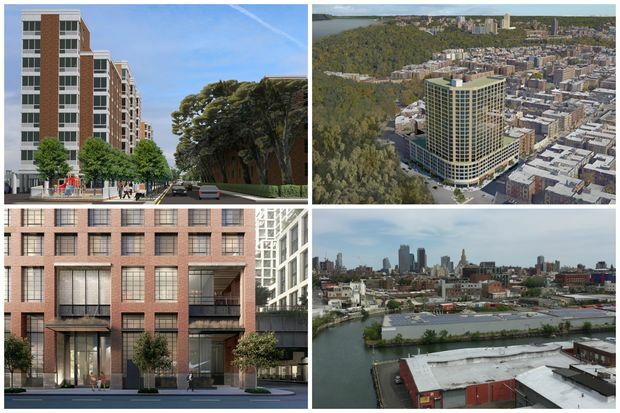 Clockwise from top left: Renderings of the Sherman Plaza development in Inwood and Phipps development in Sunnyside, both of which were killed by the City Council; Gowanus, where the city is studying a potential rezoning where MIH would apply; a proposed development at the St. John’s Terminal across from Pier 40 in Hudson Square that would contribute nearly 500 new units of affordable housing to de Blasio’s 80,000-unit goal. MANHATTAN — In the six months since the City Council passed Mayor Bill de Blasio’s Mandatory Inclusionary Housing plan to help build 80,000 new affordable units over 10 years, the policy has seen challenges, triumphs and failures. MIH requires developers to build a certain percentage of affordable housing in any new development that requires rezoning. Its deepest affordability option sets aside 20 percent of a project’s units for families earning 40 percent of the Area Median Income, or roughly $31,000 for a family of three. The administration announced eight neighborhoods facing rezoning that fall under MIH, along with roughly 1,800 “MIH units” in the pipeline for individual projects across the city, from the Lambert Houses near the Bronx Zoo to 141 Willoughby St. in Downtown Brooklyn. Housing activists have opposed MIH saying it will spur gentrification, but the mayor and top administration officials maintain that will occur regardless. But MIH alone isn’t sufficient, said Emily Goldstein of the Association for Neighborhood Housing and Development, who has been working with community groups across the city on the proposed plans. As the first neighborhood rezoned under MIH, East New York is under the microscope. Like several other areas being considered for rezonings, East New York is a low-income area with lower-priced real estate, meaning private developers will likely also use city subsidies to build new housing within the 190 blocks in northern East New York, Cypress Hills and Ocean Hill targeted under the plan. Using subsidies will allow developers to provide affordable units for New Yorkers earning as low as $25,000 — but only 10 percent of a project’s units would be reserved for them. That’s not sufficient for many residents, Goldstein said, noting that more than half in Community Board 5 make less than $34,000 a year, while about half in Community Board 16 earn less than $27,800. The other problem with relying on subsidies for deeper affordability is that there’s no guarantee that private developers will use it, she added. It remains to be seen what a future administration will allocate for housing subsidies and affordability levels in four or eight years, Goldstein said. The issue of subsidies is also important for the Jerome Avenue corridor, which could bring more than 4,000 new apartments to the 73 blocks from 167th to 184th streets under the shadows of the elevated 4 train tracks. Several local groups, including housing advocates and labor unions, formed the Bronx Coalition for a Community Vision to push for deeper affordability for new units and more protections for existing ones, where rent-stabilized tenants are already struggling to stay in their homes, they say. In The Bronx's Community Board 4, the area median income is about $27,000 a year; in Community Board 5, it’s about $21,000. The coalition is preparing for a big turnout to a public hearing on Sept. 29 on the rezoning. This rezoning — adjacent to Tompkinsville and just north of Stapleton — is small in scope and moving fast. A hearing was held in June, and the city is expected to release its first iteration of a plan in October, according to the Department of City Planning. Given the area’s local real estate market — which is stronger than East New York’s — private developers might not use city subsidy programs on top of MIH, Goldstein said. But the area slated for rezoning includes several city-owned parcels, so the fight will likely focus whether the city will provide housing with deeper affordability on the sites they can control. “Staten Island is a great example of what happens with public land within a broader rezoning,” she said. There’s a lot of MIH-related action in Upper Manhattan these days. A controversial project at Sherman Plaza came before the community in August while the neighborhood is gearing up for a larger rezoning. At Sherman Plaza, a developer proposed a 335-unit building with fewer than 70 affordable units, as per the MIH requirements of setting aside 20 percent for affordable housing. The community, however, felt that adding nearly 270 market-rate units threatened them and outweighed the gain of the affordable units. The city-led rezoning for the larger area, which is being overseen by the city’s Economic Development Corporation, has also inspired fears about displacement. The EDC held an open house on the plan in July, and has done several presentations for local groups, the materials for which are all on their website. Many residents in East Harlem's rezoning area — spanning from East 96th to East 142nd streets, between the Harlem River and Fifth Avenue — are also concerned about displacement and deeper affordability, and because the area is in the throes of gentrification, “they can’t count on developers choosing the HPD subsidy,” Goldstein noted. Residents led a collective community visioning initiative, coming up with its own plan with hundreds of recommendations backed by Council Speaker Melissa Mark Viverito. The city’s current study is building on a 2013 Community Board 11 study with input from a separate public health report that aims to bring more fresh groceries, infrastructure and open space to the area along with affordable housing. The rezoning of this area — from 35th to Sanford Avenues, between Union Street and the Van Wyck Expressway — seemed to be moving along when a hearing was held back in November. But amid mounting community concerns over affordable housing, infrastructure and transit, the local councilman turned against it. The Department of City Planning pulled the proposal in June — though it’s not necessarily shelved. This neighborhood is not one of the original neighborhoods identified by the city for MIH. Instead, residents and the local city councilman worked on a proposal to be included. “MIH is one of the many recommendations for what the community wants to see in the Gowanus area,” Councilman Brad Lander said, hoping MIH will give the community some control over how the largely industrial neighborhood changes. Locals are not so much trying to stave off gentrification — it’s too late for that, Lander said — but they want to “strengthen the things people like about the neighborhood,” like manufacturing and mixed-use projects rather than hotels, self-storage and big box stores. “MIH will enable the inclusion of low-income and moderate-income units in a high-income neighborhood,” Lander added. There are also concerns about environmental issues because of the polluted Gowanus Canal. Though the city has announced that this area will be rezoned, there’s been little information on what’s happening there. Local groups have started coming together in anticipation of what might happen, Goldstein said. “We’re watching and waiting." De Blasio recently butted heads with local Councilman Jimmy van Bramer over a potential affordable housing development in neighboring Sunnyside on Barnett Avenue. Van Bramer’s opposition caused the developer, Phipps House, to back out just this week. Phipps' proposal to bring a 100 percent affordable building with roughly 200 units to a parking lot owned by the nonprofit developer faced opposition because of the potential loss of parking. The city has not officially announced a rezoning of Bushwick, but local groups, along with the area’s councilmen, are developing a plan to eliminate rampant speculation. The most common concern from nearly 200 participants at a June forum was “truly” affordable housing, said Jose Lopez, of Make the Road by Walking, one of the groups spearheading the efforts. The majority of his group’s members earn between $16,000 and $23,000 a year, which — just as in East New York and Jerome Avenue — means that neither MIH nor the city’s subsidy program are sufficient, Lopez said, so they're hoping to find an alternative. The community also wants to focus on preserving existing affordable housing since many residents live in rent-stabilized units. Locals will meet on Oct. 15 to share ideas and set realistic goals, Lopez said. Officials from city agencies have been engaged in the process, attending meetings and giving feedback, Lopez said. Housing advocates are tracking what’s happening at 38-42 W. 18th St. between Fifth and Sixth avenues (part of which houses the Adorama camera store), where the developer applied for a special permit rather than a rezoning. Many believe the application should mean that MIH rules about affordable units should still kick in. But developer Accuity — and the de Blasio administration — have argued against that, and on Tuesday the City Council approved the plan without MIH. “As was made clear before MIH was adopted, and then again during the discussion of the Adorama application, MIH does not apply when zoning capacity is not being increased, but merely shifted,” said City Planning spokeswoman Rachelle Raynoff. Goldstein was “surprised and disappointed” by the city’s decision, saying, it could set a bad precedent.